English : Close-up of a Galápagos sea lion (Zalophus californianus wollebaeki) in Punta Pitt, San Cristóbal Island, Galápagos Islands, Ecuador. English : A 3D animation which represents the second law of Fryette, one of the main basics of modern osteopathy. View of Saksaywaman, a fortress in the foothills north of Cusco, historic capital of the Inca Empire, in today's Peru. The Killke culture started the fortress in the early twelfth century and the Incas expanded it starting in the thirteenth century. The dry stone walls are made of huge stones that are cut so precisely that they fit together without mortar. English : View of Saksaywaman, a fortress in the foothills north of Cusco, historic capital of the Inca Empire, in today's Peru. The Killke culture started the fortress in the early twelfth century and the Incas expanded it starting in the thirteenth century. The dry stone walls are made of huge stones that are cut so precisely that they fit together without mortar. English : Sherlock Holmes and the Secret Weapon (1943) is the fourth in the Basil Rathbone/Nigel Bruce series of 14 Sherlock Holmes films. U500 Donbas - Amur class floating workshop (Project 304), now command ship. Navy of Ukraine. Sevastopol Bay. English : U500 Donbas - Amur class floating workshop (Project 304), now command ship. Navy of Ukraine. Sevastopol Bay. English : Raccoon in safari Parc Omega, Quebec, Canada, June 15, 2012. English : The Juno spacecraft was launched in August 2011 and is planned to enter a polar orbit around the planet Jupiter on July 4, 2016. This NASA computer animation shows the probe's trajectory. Byzantine fresco of Saint Andrew of Crete in the church of Agia Anna (Αγία Άννα), Amari Valley, Crete. The frescoes are dated 1225 and the oldest dated frescoes in Crete. English : Byzantine fresco of Saint Andrew of Crete in the church of Agia Anna (Αγία Άννα), Amari Valley, Crete. The frescoes are dated 1225 and the oldest dated frescoes in Crete. English : Giant torito being brought onto the plaza and ignited for the festival Fiesta de Luces y Musica in the town Santiago Zapotitlan, Tláhuac, Mexico. Altar of the church of San Pedro de los Francos, located in Calatayud, Aragon, Spain. The original church was founded in the twelfth century by Alfonso I, "The Battler" as a token of gratitude to the French who helped him in the Battle of Cutanda (1120) against the Almoravids. The original church was a place for the French to pray. The present church was built two centuries later. English : Altar of the church of San Pedro de los Francos, located in Calatayud, Aragon, Spain. The original church was founded in the twelfth century by Alfonso I, "The Battler" as a token of gratitude to the French who helped him in the Battle of Cutanda (1120) against the Almoravids. The original church was a place for the French to pray. The present church was built two centuries later. The church of Saint Metropolitan Peter in Pereslavl, Russia. Roof view from inside. English : The church of Saint Metropolitan Peter in Pereslavl, Russia. Roof view from inside. View of the principal façade of Buckingham Palace, the London residence and principal workplace of the monarchy of the United Kingdom. The palace, located in the City of Westminster, was originally designed by Edward Blore and completed in 1850. The current appearance is the result of a renovation by Sir Aston Webb in 1913. English : View of the principal façade of Buckingham Palace, the London residence and principal workplace of the monarchy of the United Kingdom. The palace, located in the City of Westminster, was originally designed by Edward Blore and completed in 1850. The current appearance is the result of a renovation by Sir Aston Webb in 1913. English : NASA's Juno spacecraft has crossed the boundary of Jupiter's immense magnetic field. Juno's Waves instrument recorded the encounter with the bow shock over the course of about two hours on June 24, 2016. "Bow shock" is where the supersonic solar wind is heated and slowed by Jupiter's magnetosphere. It is analogous to a sonic boom on Earth. The next day, June 25, 2016, the Waves instrument witnessed the crossing of the magnetopause. "Trapped continuum radiation" refers to waves trapped in a low-density cavity in Jupiter's magnetosphere. Nave of the abbey of Santa María la Real de la Oliva, a still-active Cistercian monastery located in Carcastillo, Navarre, Spain. The abbey was founded in 1150 on the death of King García Ramírez of Navarre. The construction of the temple was inspired by the French abbeys of Morimond and Escaladieu. English : Nave of the abbey of Santa María la Real de la Oliva, a still-active Cistercian monastery located in Carcastillo, Navarre, Spain. The abbey was founded in 1150 on the death of King García Ramírez of Navarre. The construction of the temple was inspired by the French abbeys of Morimond and Escaladieu. English : Linderhof Palace in southwest Bavaria, Germany is the smallest of the three palaces built by King Ludwig II of Bavaria and the only one which he lived to see completed. The water parterre in front of the palace is dominated by a large basin with the gilt fountain group Flora and puttos. The fountain's water jet is nearly 25 m high. A marine iguana (Amblyrhynchus cristatus) lying on a rock on the coast of Las Bachas, Santa Cruz Island, Galápagos Islands, Ecuador. English : A marine iguana (Amblyrhynchus cristatus) lying on a rock on the coast of Las Bachas, Santa Cruz Island, Galápagos Islands, Ecuador. English : The Vagabond is a silent film by Charlie Chaplin released to theatres on July 10, 1916. Interior view of the dome of the church of Santo Domingo, Historic Centre of Lima, capital of Peru. The site, built between 1535 and 1578, is also a basilica and a convent. It was destroyed by an earthquake in 1678 and rebuilt shortly afterwards with the current appearance. The church mixes different architectural styles: Neoclassical, Rococo and Renaissance. English : Interior view of the dome of the church of Santo Domingo, Historic Centre of Lima, capital of Peru. The site, built between 1535 and 1578, is also a basilica and a convent. It was destroyed by an earthquake in 1678 and rebuilt shortly afterwards with the current appearance. The church mixes different architectural styles: Neoclassical, Rococo and Renaissance. English : Video showing an opening and closing of The Rolling Bridge in Paddington Basin, London. A street in Souq Waqif, a souq in the Mushayrib district of Doha, capital of Qatar. Souq Waqif (Arabic for "standing market") is a former livestock market dating to the end of 19th century and the beginning of the 20th century. Today, it has become a popular meeting place with shops, restaurants, and hookah lounges. English : A street in Souq Waqif, a souq in the Mushayrib district of Doha, capital of Qatar. Souq Waqif (Arabic for "standing market") is a former livestock market dating to the end of 19th century and the beginning of the 20th century. Today, it has become a popular meeting place with shops, restaurants, and hookah lounges. English : Fallow deer (Dama dama) in Parc Omega, Quebec, Canada, June 13, 2012. The NASA's New Horizons spacecraft captured this high-resolution enhanced color view of Pluto on July 14, 2015. 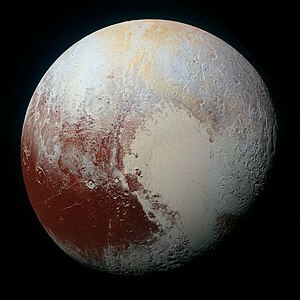 English : The NASA's New Horizons spacecraft captured this high-resolution enhanced color view of Pluto on July 14, 2015. English : Explosion of the Judas figurine at the 4th Feria de Cartoneria in Santa Maria la Ribera, Mexico City, 26. March 2016. Black-bellied whistling ducks (Dendrocygna autumnalis), Tobago. English : Black-bellied whistling ducks (Dendrocygna autumnalis), Tobago. English : Philippine's Independence Proclaimed, 1946/07/04. Celebration, speeches of Manuel Roxas - new president and general MacArthur. Steps and pulpit of the refectory (dining room) of the Cistercian Monastery of Santa María de Huerta. The monastery is located in the village of Santa María de Huerta, province of Soria, Castille and León, Spain. The first stone of the building was laid in the 12th century by the king Alfonso VII of Castile and the building was expanded in the 16th century thanks to the help of the kings Charles I and Philip II. The refectory, built in 1215, is the jewel of the monastery and one of the best examples in Europe. The pulpit was used by a monk for reading during meal times. English : Steps and pulpit of the refectory (dining room) of the Cistercian Monastery of Santa María de Huerta. The monastery is located in the village of Santa María de Huerta, province of Soria, Castille and León, Spain. The first stone of the building was laid in the 12th century by the king Alfonso VII of Castile and the building was expanded in the 16th century thanks to the help of the kings Charles I and Philip II. The refectory, built in 1215, is the jewel of the monastery and one of the best examples in Europe. The pulpit was used by a monk for reading during meal times. English : The saxophonist David Hernando performing Caprice No.5, by Niccolò Paganini. Panoramic view of Lake Umayo and the Sillustani burial ground (the 2 towers on the right) in Peru. Sillustani is a pre-Incan cemetery with tombs built above ground in tower-like structures housing the remains of nobles. The site was built by the Aymara, who were conquered by the Inca in the 15th century. English : Panoramic view of Lake Umayo and the Sillustani burial ground (the 2 towers on the right) in Peru. Sillustani is a pre-Incan cemetery with tombs built above ground in tower-like structures housing the remains of nobles. The site was built by the Aymara, who were conquered by the Inca in the 15th century. English : Birds Palawan hornbill (Anthracoceros marchei) at Zoo Eagle Point Resort, island Luzon, Philippines. A great blue heron (Ardea herodias) looking for fish in the coastal rocks of Las Bachas, Santa Cruz Island, Galápagos Islands, Ecuador. English : A great blue heron (Ardea herodias) looking for fish in the coastal rocks of Las Bachas, Santa Cruz Island, Galápagos Islands, Ecuador. English : Aerial recording of Wiesen Viaduct (1192 m, Davos, Grisons, Switzerland). Door of the Chapel of the Annunciation, Cathedral of Santa María, Sigüenza, Castile-La Mancha, Spain. The chapel was founded in 1515 by the judicial vicar Fernando Montemayor. The exquisite portal is decorated in Cisneros style and has images of St Michael and St James at the bottom, Moorish elements in the arch, and a scene of the Annunciation in the frieze. The cornice is of Arab style with Gothic style arches and a Calvary scene in the middle. The iron grille, in a gothic style with renaissance ornaments, is the work of Juan Francés. English : Door of the Chapel of the Annunciation, Cathedral of Santa María, Sigüenza, Castile-La Mancha, Spain. The chapel was founded in 1515 by the judicial vicar Fernando Montemayor. The exquisite portal is decorated in Cisneros style and has images of St Michael and St James at the bottom, Moorish elements in the arch, and a scene of the Annunciation in the frieze. The cornice is of Arab style with Gothic style arches and a Calvary scene in the middle. The iron grille, in a gothic style with renaissance ornaments, is the work of Juan Francés. English : Bird–drone interaction. Filmed on Eagle Mountain Lake, North Texas, USA. English : A Prusa i3 MK2 print farm producing parts for new printers in the project RepRap. Landscape of frozen vineyards near Castillo de Lerés, province of Huesca, Spain. English : Landscape of frozen vineyards near Castillo de Lerés, province of Huesca, Spain. English : A W-type external-thread collet being pulled into its spindle seat with a drawbar, clamping and then releasing a shaft. Northern slope of the puy de Dôme seen from the puy Pariou in Auvergne, France. English : Northern slope of the puy de Dôme seen from the puy Pariou in Auvergne, France. English : Komatsu 941 harvester (Komatsu Limited) - robust all terrain forestry vehicle that allows one person to cut the tree and to remove branches at once, while sitting inside the driving cab in safety. Original mailbox of the headquarters of the Post and Telegram Office in Lima, capital of Peru. English : Original mailbox of the headquarters of the Post and Telegram Office in Lima, capital of Peru. English : Juvenile snow leopards (Uncia uncia) at Salzburg Zoo, Austria. Lake Salinas is a salt pan located in the Arequipa Region, Peru. It is located within the Salinas and Aguada Blanca National Reservation. The lake is 4,300 metres (14,100 ft) above sea level and covers an area of 6,182 hectares (15,280 acres), but shrinks to a thin salt crust in the dry season. English : Lake Salinas is a salt pan located in the Arequipa Region, Peru. It is located within the Salinas and Aguada Blanca National Reservation. The lake is 4,300 metres (14,100 ft) above sea level and covers an area of 6,182 hectares (15,280 acres), but shrinks to a thin salt crust in the dry season. English : Operation Gomorrah, the bombing of Hamburg for 8 days and 7 nights took place between July 24th and 3rd of August 1943, resulting in 45 to 50,000 Civilian deaths. View of the coastal tower of San Saturniño, Cambados, province of Pontevedra, Galicia, Spain. The fortification was possibly built during the first settlement in the region of Cambados. The fortification is a national monument and dates from the second half of the 10th century, but was destroyed betweeen 1466 and 1470 during the Irmandiño revolts. The fortification had several functions: residence, watch tower, and lighthouse. English : View of the coastal tower of San Saturniño, Cambados, province of Pontevedra, Galicia, Spain. The fortification was possibly built during the first settlement in the region of Cambados. The fortification is a national monument and dates from the second half of the 10th century, but was destroyed betweeen 1466 and 1470 during the Irmandiño revolts. The fortification had several functions: residence, watch tower, and lighthouse. English : The Bath Covered Bridge is a historic covered bridge over the Ammonoosuc River in Bath, New Hampshire, USA. The bridge, built in 1833 by the town of Bath, has a span of over 390 feet and a roadbed that is just over 22 feet wide. View of Tarazona, Spain, from the Episcopal Palace. English : View of Tarazona, Spain, from the Episcopal Palace. English : Full restored film of Fear and Desire, Stanley Kubrick's 1953 debut film. Kubrick attempted to destroy all copies, but was unsuccessful. Foggy morning view of the Basilica of Our Lady of Jerusalem, Artajona, Navarre, Spain. The basilica was built between 1709 and 1714 in honor of Our Lady of Jerusalem, patron saint of Artajona. English : Foggy morning view of the Basilica of Our Lady of Jerusalem, Artajona, Navarre, Spain. The basilica was built between 1709 and 1714 in honor of Our Lady of Jerusalem, patron saint of Artajona. English : Drone view of castle ruins Burg Hals in Passau, Lower Bavaria, Germany. Lake Kanariku in Võru County, Estonia. English : Lake Kanariku in Võru County, Estonia. English : Humanoid robot ASIMO dancing. Tallinn Seaplane Harbour and aeroplane hangars and icebreaker Suur Tõll. English : Tallinn Seaplane Harbour and aeroplane hangars and icebreaker Suur Tõll. English : Geisha in Yudanaka Onsen dancing. English : The Egyptian president Gamal Abdel Nasser tells a crowd he has seized the Suez Canal, pictures of canal and Mideast (partial newsreel, 30th July 1956). English : Drone view of mountainous area in Utah, USA.